These days, you'll find plenty of people brewing their own variants of wet hop or fresh hop beers come harvest time, utilising hops taken from the farm in their beers on the day they are picked without drying or processing them first. Australia's most notable exponent of such beers has been Bridge Road Brewers who, for a number of years (eight, they reckon), has taken full advantage of their proximity to one of the country's largest hop farms to use unreleased, experimental varieties in the annual Harvest Ale and, more recently, Dark Harvest. There's been a little switching around of varieties over the years and in one year the hop they used was one that had been consigned to the scrapheap by Hop Products Australia only to be saved and released as Vic Secret once they saw what it did in his beer. This time around, the two beers feature tried and tested Bridge Road favourites, with up to a whopping 50kg of wet hop flowers added to each brew. 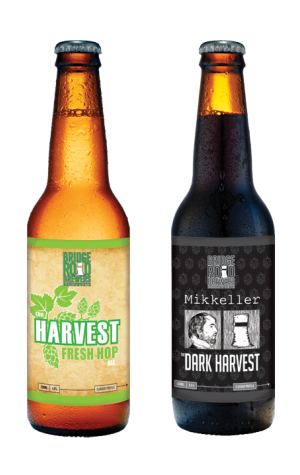 The Harvest Fresh Hop Ale uses the simplest of pale malt bills to allow its citrus hop characters to shine, while the Dark Harvest is one of our favourite dark beers released in Australia each year (well, except when they tried a different hop in year two). Originally brewed with Mikkeller overnight during March 2012, Bridge Road's Ben Kraus reckons the hop variety used, still tagged 016, is Australia's answer to Citra. We have always found it to give the beer the most amazing choc orange character and this is no different, with the bold dark chocolate, almost roasty malts joined by a juicy tangerine or mandarin flavour to create an experience akin to eating a luscious orange creme after dinner chocolate. But more drinkable than that sounds.